Home > Vampire Fangs Dentist > Vampire Fangs: Spookiness Guaranteed! Halloween is almost upon us. If you haven’t decided your getup for this year’s festivities, may we suggest dressing up as a vampire? Yes, vampires are quite cliche but there is a solid reason behind this! No one can ever remain impartial to a vampire; everyone has some sort of emotional reaction when they behold a beautiful blood sucker! Some react with fear, others with admiration. And you can rest assured that if done right, your vampire costume will make you the talk of the town for quite some time! You can dress up all you want but no vampire is recognizable without his fangs! But you must be tired of those tacky, plastic ones that claim to be the “it” new thing but in reality, are uncomfortable and weird. Why don’t you go ask your dentist if he can get you some permanent fangs? Dentists are in great demand during this time of the year. In fact, our dentist is doing up to 8 such procedures every week. The process is simple really; the dentist will take a cast of your existing teeth and discuss your requirement of fangs. Here you can let them know how many, and what size and number of fangs you would like in your mouth. Then you will be asked to wait a couple of weeks after which you will be able to go in and have the new teeth fixed on top of your existing ones.These teeth can be permanent i.e. they are a lifetime commitment. 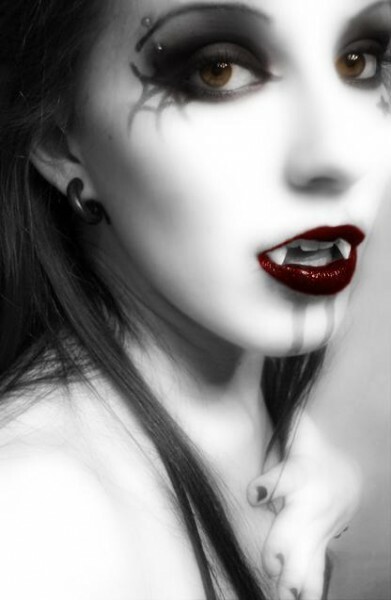 If you would like the kind that can be taken off after a year’s use, let your dentist know in advance.These dental cosmetic treatments have now become the top method of getting vampire fangs. The trend may have started in Japan, but it’s our Edward-lovers and Blade-fanatics that have made it all the rage.So if you are going for the ultimate Transylvanian look, do consider these custom vampire fangs. This article was posted in Vampire Fangs Dentist and tagged blood sucker, cliche, Dentist, getup, Teeth. Bookmark the permalink. Follow comments with the RSS feed for this post. Trackbacks are closed, but you can Post a Comment. ← Vampires! Fangs! Bites! Oh My! One Response to "Vampire Fangs: Spookiness Guaranteed!" Aug28 Very wonderful content. I recently discovered this site and wanted to say that I’ve truly really liked browsing your current content. Regardless I will be subscribing to your feed.